Recently I was invited to speak to MBA students at Imperial College London on Lean Product Development, which is an offer I couldn’t refuse as it’s a topic I’m very passionate about. 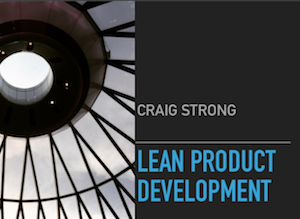 There are a lot of interpretations of what Lean Product Development is depending upon your domain and environment. My experience and interpretations is that, Lean Product Development in a digital context is very much a combination of traditional Lean principles combined with Agile, Lean Startup and Design Thinking principles. This combination embraces in it’s simplest for embraces continuous deployment , measured release cycles which are tested against the customer needs, there these learnings are fed back into the product. This combination could also be explained as Lean principles being those which advocate spending the minimum amount of effort to deliver a given value or learn what you need to know, and Agile being a set of principles which embraces those lean principles, but extends them to includes practices which allow you to respond to change as you learn. In this talk I recognise the disruptive world we live in and how digital has changed everything, how traditional planning is often broken for our complex and/or complicated domains, how much of the governance we inherit around is it not suitable and is a huge constraint, and share some techniques we can practice to increase our speed of learning and delivering higher value such as Minimum Viable Products (MVP) as a process. If you have any feedback or questions, please leave in the comments below.